According to news reports, a Civil War re-enactor who was injured during a documentary film shoot when he was struck in the shoulder by a shot apparently fired from the pistol of another re-enactor. Apparently, some of the re-enactors were unaffiliated walk-ons who weren’t familiar with the chain of command or safety procedures. I’m sure news of this sort cause s people to regard reenactments as dangerous. However, dealing with these groups while writing their re-enactment insurance every day you find out that these are some of the most professional and safety conscious people you will come across. They are often current or former military or police (sometimes both) so they have been well trained. They are not there to simply “play with guns,” but to preserve our country’s history. That doesn’t mean the occasional accident doesn’t occur, some of them being rather freaky. A spark from a cannon fired by re-enactors in Utah landed on a pouch containing additional explosive charges, which ignited injuring three children. During a reenactment of the Battle of Wilson’s Creek in Missouri a Union cavalryman was injured when his horse stepped on his groin. It isn’t know how he managed to get into a position where his horse could do that. Lightning struck a camp of Civil War re-enactors in Gettysburg sending five people to the hospital. 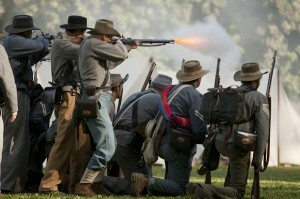 Two re-enactors from Plymouth, N.C. were injured in a canon explosion. One of the men was packing the cannon charge and it seems there was a live ember from a previous firing. The foil apparently broke causing the cannon to explode. A child was injured by a muzzle blast during a Gettysburg skirmish reenactment. Yes, we offer re-enactment insurance! Call us at (800) 622-7370 for a quote.